I've never liked carrot cake. 1. I'd find things like raisins, crushed pineapple, and coconut in the cake. And, sit there with my fork and attempt to pick them out. And, nuts. Always nuts. I like nuts in general, but I don't like them in carrot cake. 2. I don't like spice cakes. Allspice, cloves, nutmeg - too much of that makes me feel all itchy in the mouth. I just have an aversion to too much of those kinds of spices. 3. Long, stringy carrots. 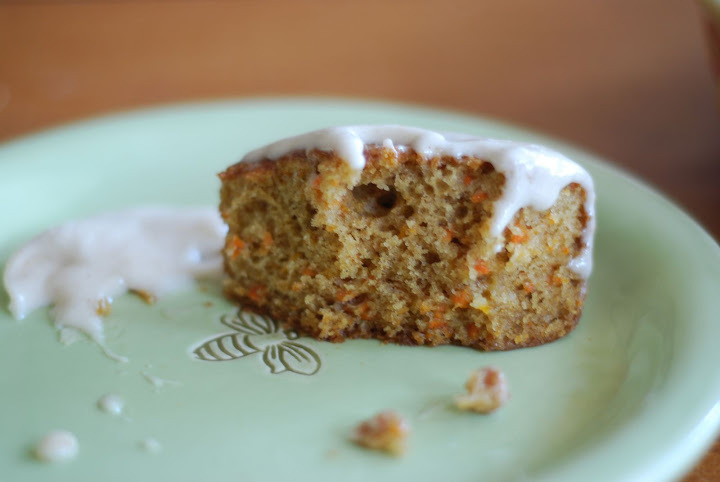 I don't know, I just never warmed up to the idea of an inch long piece of carrot in a cake. So, I came up with a recipe that is - well - simple. No nuts, no raisins, no pineapple. No overpowering spices. And, no long, stringy carrots hangin' off the fork. 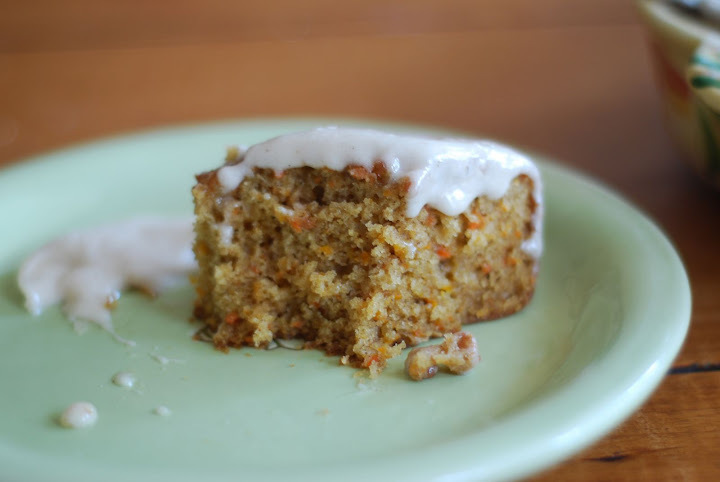 Just a simple, delicious, moist carrot cake. This cake makes me wanna take a running leap right into it and swim in the frosting. Oh, how I love this frosting. Specks of cinnamon are swimmin' in it. They're living the life I was meant to live. This cake is made extra moist and rich by the addition of buttermilk - into the cake and in the frosting! And, I pulse the livin' daylights out of the carrots with a food processor, resulting in little bits of carrot, instead of stringy strings. I couldn't wait for the cake to cool to frost it and dig in. So, I grabbed my favorite plate and cut a piece. That's warm frosting dripping down the side. And, on my favorite plate. Heaven, help me. I thought I'd snap a photo after I took a bite. Oh, how I suffer in the name of photography. 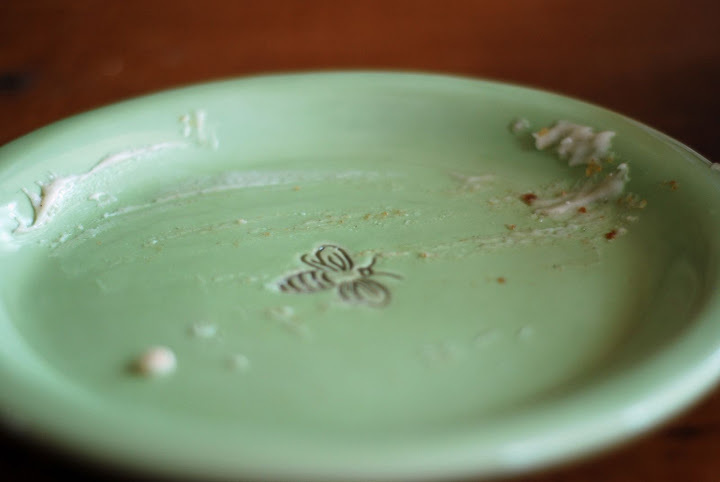 Isn't this plate just a perfect shade of green? But, that's not why it's my favorite. You'll see why in a minute. Nah, maybe one more bite and I'll have the shot I want. Nope. Not it. Surely one more bite and I'll have the perfect shot. Umm. That's not the look I was going for. Somebody stop me. I could never leave my plate lookin' like this. Never. Ever. Finger swiped up every last delicious bit of that frosting. That little guy in the middle stole my heart the minute I saw him on a Pottery Barn shelf - just sittin' on a beautiful, milky green plate. I bought six of them. I love them. 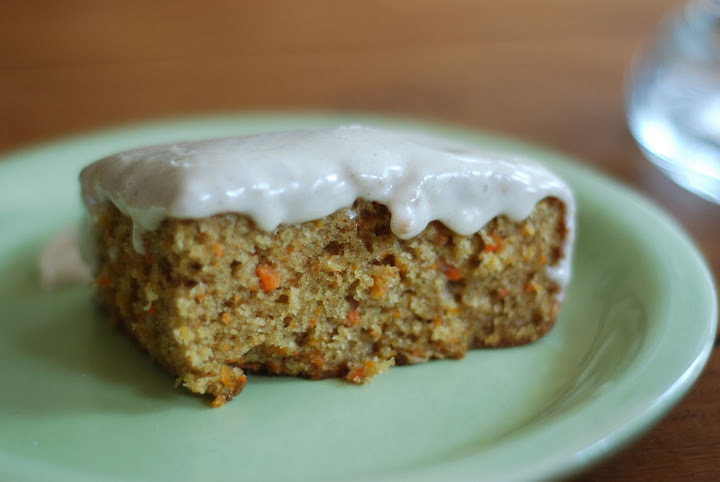 Make this carrot cake. Grab your favorite plate. You'll be finger swipin' the icing, too. Preheat oven to 350 degrees. Grease and flour a 9 x 13 baking pan. In a large bowl, combine flour, cinnamon, baking soda and salt and mix well with a fork. Set aside. In a mixing bowl, combine sugar, brown sugar, vegetable oil, and buttermilk. Beat with electric mixer until combined. Add eggs and mix thoroughly. Fold in chopped carrots. Slowly add flour mixture, mixing only until flour disappears. Pour batter into pan and bake at 350 degrees for 40 minutes, or until center bounces back when lightly pressed. 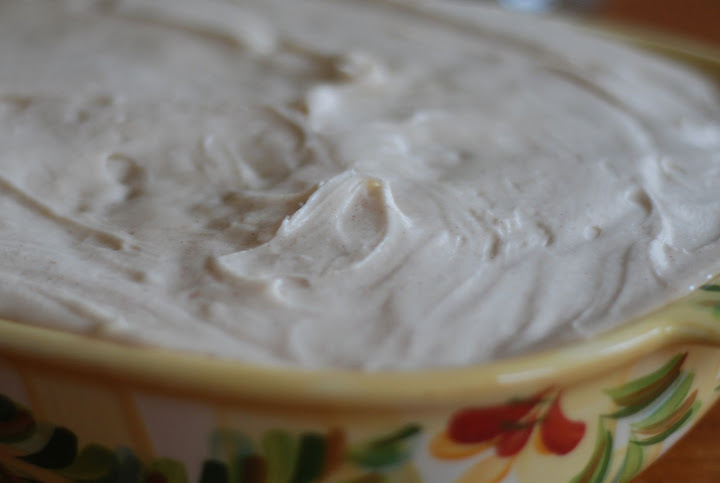 For the frosting, combine cream cheese and butter in a mixing bowl and beat until fluffy - approximately 2 minutes. Add the confectioner's sugar and vanilla and beat on low speed until combined. Add buttermilk, milk, and cinnamon and beat until frosting is light and fluffy. Add more milk, if needed to get to desired consistency. Frost. Eat. Serve. Lick clean. Repeat as often as you like. You are, after all, eating vegetables. oh yes! i am trying this next week... i have a huge aversion to the other stuff in them as well - i always ask at restaurants before i order. waitresses probably think i'm crazy. but, seriously - pineapple and raisins?!? Yum! I so agree about the carrot shreds, coconut and nuts (yuck) in the cake. This one looks so good - and I love the plate too! Can I please come live in your house?? That looks so incredible! I'm a sucker for anything with cream cheese frosting!!! I'll let you know how quickly I find the bottom of my plate with this one! Too bad I don't have as cute a plate! Oh this sounds delicious. I haven't always liked carrot cake, but have been better about it in recent years and that looks awesome. Not to mention, another way to sneak veggies in to the kids. LOL. BTW, tried the chicken broccoli alfredo last night -- it was a hit! This is right up my husband's alley. He could have written your "3 reasons" verbatim. Thanks for this recipe, I will have to share! Thank you for making it, for sharing the recipe, and for sending it with Jason to work today. 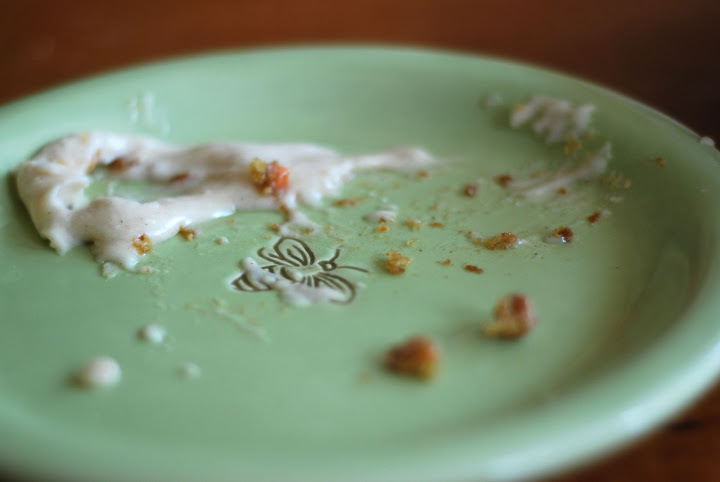 Anytime you need to make baked goods disappear, we'll be happy to help you out! To other blog readers: I had the privilege of eating a slice (ok two) of this cake - Jason brought it to work today! 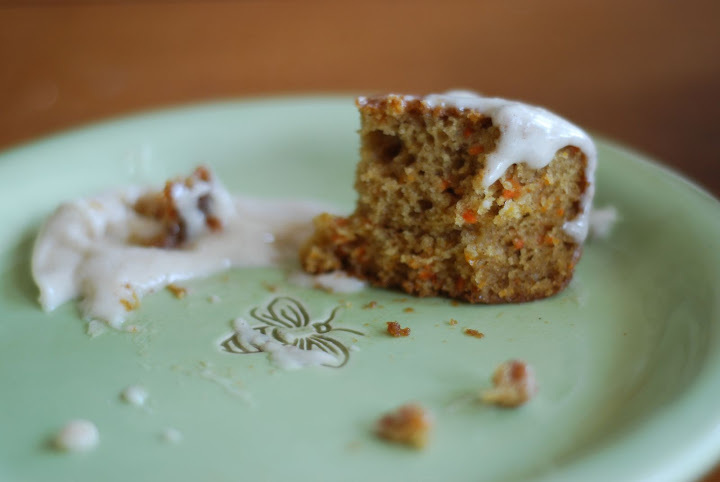 I'm telling you, it is hands-down the very best carrot cake I have ever had. You MUST make it for yourself, your family, or friends...the dog...whoever, just make it, and don't just eat it, savor it. Sarah: if I had the money, I'd hire you as my personal chef. This cake is awesome! I could eat just a bowl of the frosting too! Thank you for sharing the cake with Jason's co-workers - we're lucky! Oh, mercy! That looks good. Sar...I love your friendship for the following reasons: 1. For your cinnamon-ness. 2. Because you took pics of the cake disappearing. 3. Because you're the kind of friend who would eat cookie dough with me and not make a big deal of it. 4. 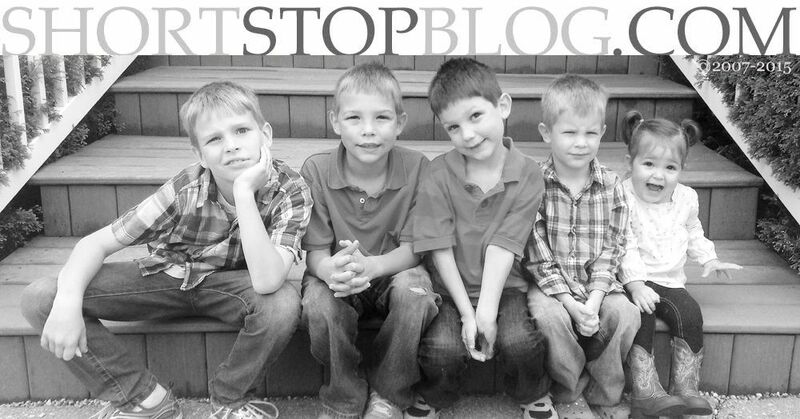 Because you refuse to let a busy life with three boys keep you from blogging. And there's tons more, but that's a good start. Geez, I want that cake now. Will you come over and make it for me? your carrot cake looks scrumptious! i, too, don't like the traditional carrot cake for the same reasons you listed. i say please leave out the raisins and nuts (don't think i've ever had pineapple in it). many years ago, a good friend of mine served a delicious carrot cake for dessert. i wasn't even going to try it until i heard it didn't have the "yucky" stuff in it. 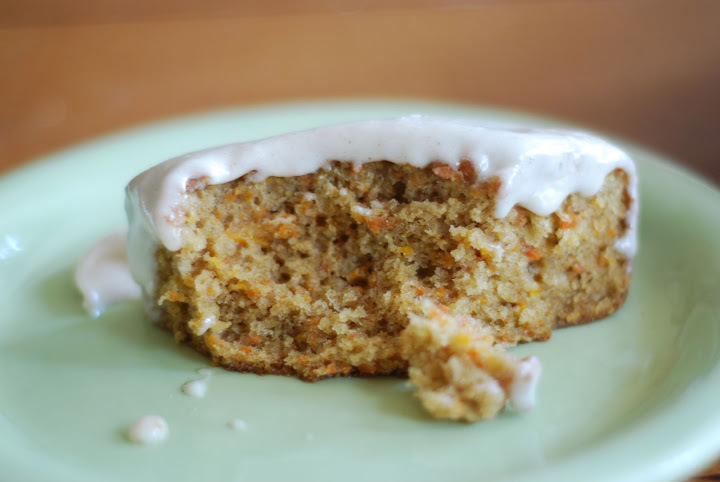 not only did she make her cake without that stuff, but it's made with baby food carrots. i know, it doesn't sound very appetizing, but believe me... it is yuuuummmmmmmy. of course, the frosting has something to do with that, too. i've been making this cake ever since. next time i make it, i'm gonna try your frosting, tho. 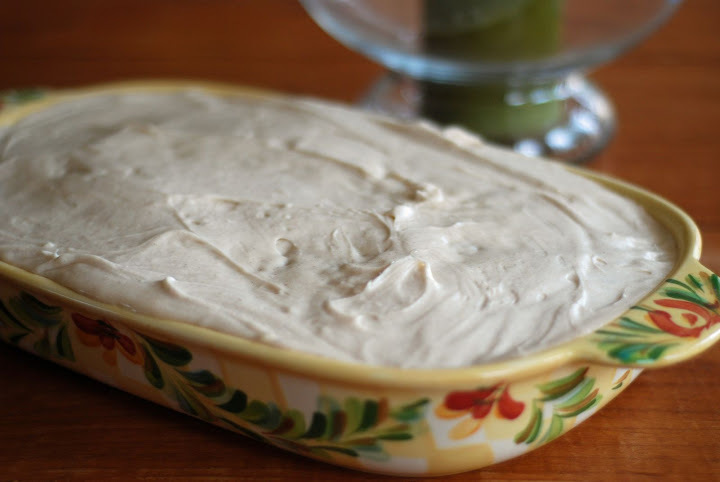 you had me at cream cheese frosting friend - one of my favorite things. this looks so yummy! can't wait to try it out. btw - love the baking pan so fun! My daughter and her family are coming for dinner on Sunday. They will get carrot cake for dessert. have you ever made cupcakes w/ this recipe?